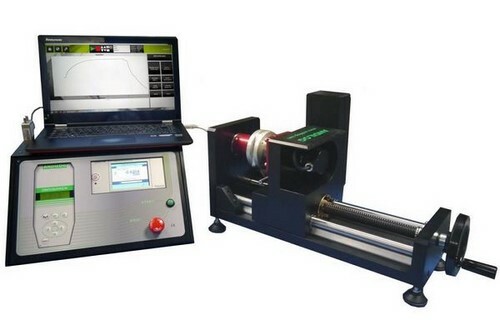 The DriveTwist model is an automated torque test bench for all static torque measurement. 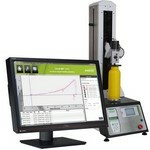 It offers high accuracy, repeatable testing and large versatility for torsion applications. 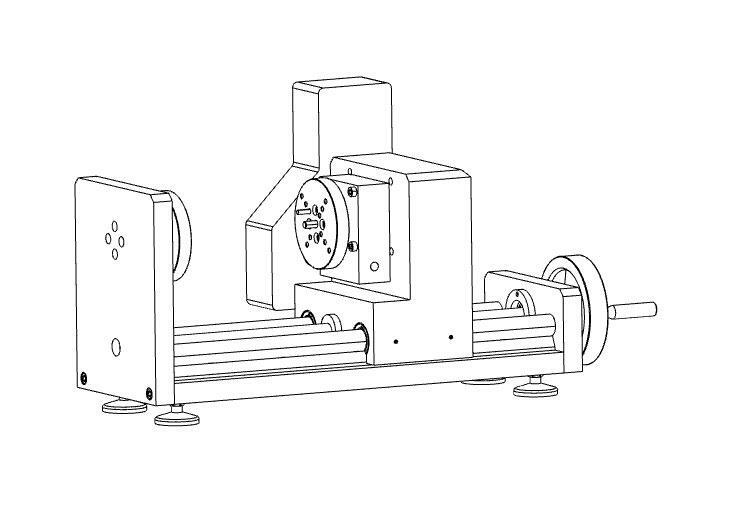 It's specially designed to determine the torsion properties of components subjected to twist loading in service. Thanks to its motorized command, set the speed of your test protocol and perform your torsion test without the influence of the operator. 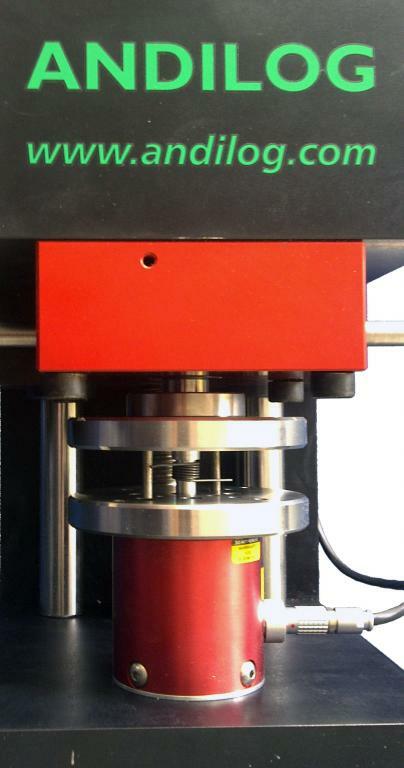 The DriveTwist suits a large broad of applications: spring torsion test, material testing, component testing, rotary actuators for rotation, torsional stiffness. The test bench is designed with a horizontal rigid baseplate, precision-engineered with a linear guidance system, which ensures the fine precision displacement of the measuring platform The platform combines a torque reaction sensor and an accurate encoder which measures the angular displacement. Platens are pre-designed to allow attachment of component or test specimen to the mounting base plate. In addition, ANDILOG offers a wide range of standard grips or can advise and design per specifications dedicated fixture to reply to your samples shapes. The motor command and measurement acquisition is done through the DriveTouch controller, which includes the latest advanced technologies. Thanks to its ability to read simultaneously data from two sensors, the DriveTouch controller measures data from the static torque transducer and from the rotary encoder. Automated your test thanks to the material software CALIFORT. Usually used to setup complex test protocol and sequenced testing applications (pre-load, automatic return, cycles, multi-stages…), to save data&curves for a full tractability and with reports edition. Determine the torque characteristics and mechanical performance of your sample, with the DriveTwist torque test bench, a complete and advanced measuring solution. The torque test bench DriveTwist is designed to include two high accurate sensors: torque and angular displacement. Those two sensors are perfectly aligned to ensure the quality of measurements in the axis of the sample. Reaction Torque Sensor: the most sensible part of the torsion tester. Available in six different capacities, to choose from 0.35Nm up to 24Nm and equipped with our SPIP plug and play technologies. So the DriveTwist torque test bench offers the flexibility of having several torque sensors and one dedicated test bench in order to cover a large range of applications and capacities. With an accuracy of 0.5% of the full scale of the torque sensor, it is recomended to use them in their 10% to 90% range. Angular displacement : Measurements are done through a rotational encoder, with a high resolution of 0.1°. Mounted directly on the sample rotational axis for a accurate angular movement. The controller includes a motor command and a measurement screen. Fine positional adjustments and the first runs can be done manually through the motor command. The display shows in real time the speed and angular displacement. Also the command includes low and high speed (adjustable) keys. 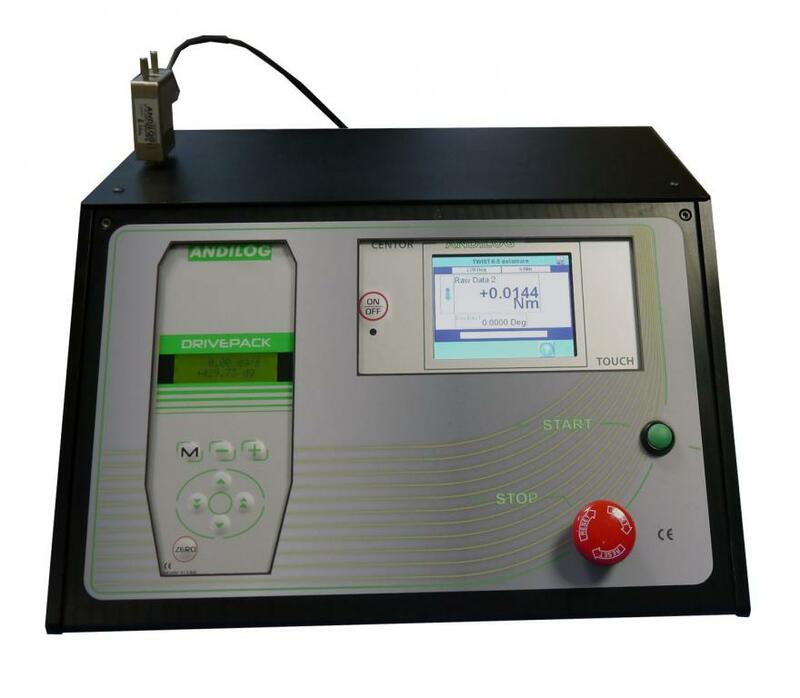 The measurement advanced touch screen interface allows a uses of the torque tester without software, for a manual testing setup. The console shows in real time and simultaneously the torque and angle measured values. Thanks to its live graphing mode, you can pre-view your graphical results and calculations. Nevertheless the DriveTwist controller includes also TTL inputs/outputs allowing a connection with a programmable logic controller. The automated torque test bench DriveTwist is fully controlled by the materials testing software Califort. 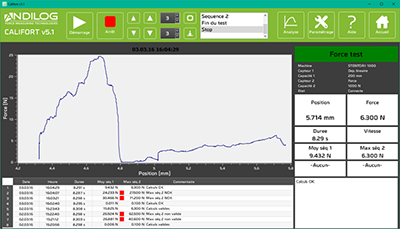 This advanced software allows the operator to control and monitor all the features of the sequenced test. Acquisition of the graphical results torque/displacement or torque/time and calculations (break, average, maximum, ...) is fully automated, as well as the recording of all the data. Transfer the results to a spreadsheet (i.e. ; Excel) for further analysis, or edit directly your report to a Word format for a complete tracability or customer reports purposes (with your own corporate templates). Setting the multi-stage test is done sequentially and has an intuitive flow. The test configuration is guided by a step by step process, and no programming knowledge is required. By following the simple sequences of the various stage of defining your test, the user quickly build advanced multi-stage test routines and calculations required at the end of each test.